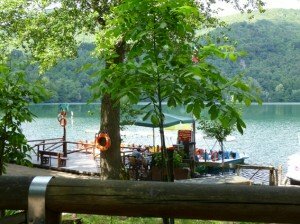 So having chanced upon the wondrous Laghi di Monticchio after our laborious travails through the hills of Basilicata, we promised ourselves to come back and explore this little hidden paradise properly. This is exactly what we did a few days later, following the much easier route from Calitri along the gently winding valley road en route to Melfi. Well before that town, however, you turn off and upwards towards Rionero in Vulture. Here the world gets green, very green. It’s all chestnut trees, oaks and birches in a veritable riot of verdant loveliness. Birdsong sounds in the forest, though it’s hard to hear as you meander uphill past a water bottling plant and sleepy little village where I have yet to see a living soul stir. Eventually, though, you sense you’ve reached a high point as the road levels out and you near the lakes. OK, that’s a bit of a poetic leap, but the twin lakes of Monticchio are situated high above the surrounding valleys, filling an arête-like basin between two mountain peaks. 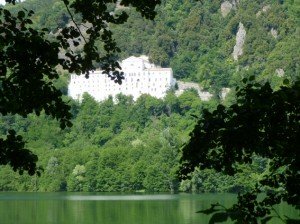 Perhaps this setting is what gives the Laghi di Monticchio their special and somewhat mysterious quality. At any rate, there certainly is an impact when you first come upon the sight of a sparkling blue Alpine lake surrounded by thick forest. We visited on a Saturday morning when the sun was shining and bathing all this natural splendour in a Hollywood gloss. Picture a turquoise expanse of water hemmed in by an ascending carpet of deep green forest, topped with rocky outcrops and singularly dotted with a bright white fairytale castle – quite the setting for a neo-romantic tale of princes and fair maidens. The quaint wooden restaurants and curio shops add a typically Italian earthiness to the setting, almost representing the medieval village of peasants at the foot of the lofty castle positioned midway to the heavens. Here, children run around in high spirits, parents prepare picnics and BBQs, teenagers kick a ball around and the adventurous goes in search of bikes. The restaurants were beginning to fill up, the smell of baked pizza bread wafting lazily through the air, arousing appetite in humans and no doubt wistful lament in the creatures of the forest, who after all can smell but aren’t on the invitation list. 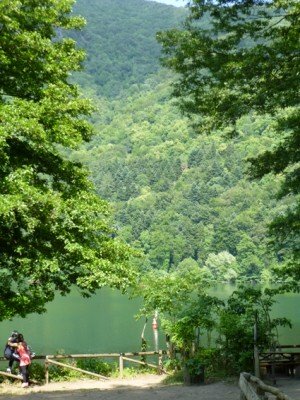 Resisting the youthful temptation to jump on a pedalo or commission the stout captain of a little speedboat to whisk us around the periphery of the lake, we strolled along the lake. As if drawn by this mysterious ‘castle’, which I was certain was home to a luxurious spa resort (yeah, I’ve lived in Marbella too long), we walked along until we had made a semicircle around the lake, finding there a little restaurant overlooking the water where we could quench our thirst and enjoy a light meal in the classic Italian style. The view back across the lake was delightful, the people on the pedalos and boats seemed to be having fun and the food was good – it almost never isn’t in Italy. It was quite a relaxing sensation, and I could quite happily have snoozed in a hammock by the waterside, but eventually we left, having inquired as to the nature of the spa hotel, which turned out to be neither a spa nor a hotel, but a monastery. How Italian! Of course it was a monastery, what was I thinking. No sooner were we mulling over the ramifications of this discovery (I was still convinced they might let us use their spa facilities) when we met a monk. Jackie was keen to address him but he strode past us with resolute steps and an ‘I don’t do small talk’ look on his face. OK, I guess using the spa at the monastery is off the cards, but it did add to the medieval parallel I’d been keeping up. Passing families on bicycle taxis and campers setting up, we reflected that this is certainly a place to keep coming back to and exploring, for these volcanic lakes form the basis of a little natural wonderland at a stone’s throw from Calitri. This entry was posted on Sunday, September 29th, 2013 at 3:44 pm	and is filed under Calitri, Environment, Food & drink, Italy, Travel. You can follow any responses to this entry through the RSS 2.0 feed. Both comments and pings are currently closed.